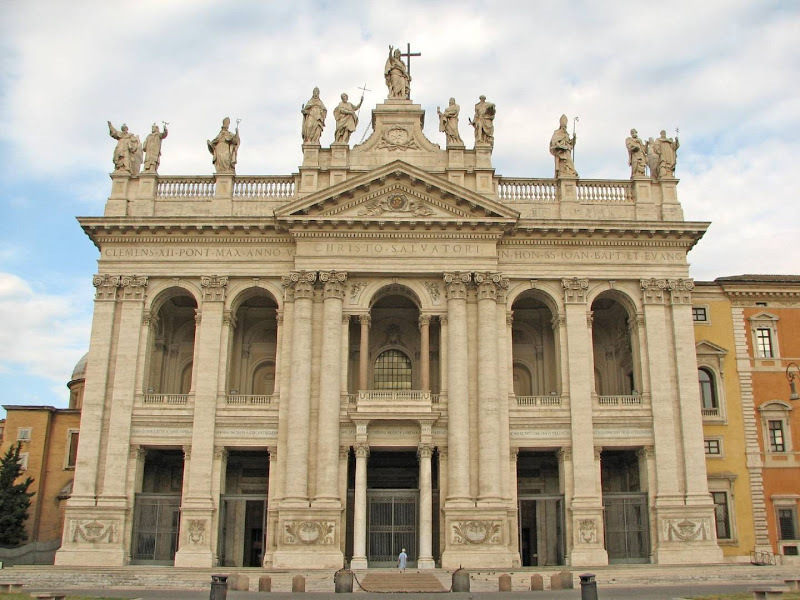 “This is the oldest, and ranks first among the four great “patriarchal” basilicas of Rome. The site was, in ancient times, occupied by the palace of the family of the Laterani. A member of this family, P. Sextius Lateranus, was the first plebian to attain the rank of consul. In the time of Nero, another member of the family, Plautius Lateranus, at the time consul designatus was accused of conspiracy against the emperor, and his goods were confiscated. Juvenal mentions the palace, and speaks of it as being of some magnificence, “regiæ ædes Lateranorum”. Some few remains of the original buildings may still be traced in the city walls outside the Gate of St. John, and a large hall decorated with paintings was uncovered in the eighteenth century within the basilica itself, behind the Lancellotti Chapel. A few traces of older buildings also came to light during the excavations made in 1880, when the work of extending the apse was in progress, but nothing was then discovered of real value or importance. The palace came eventually into the hands of Constantine, the first Christian emperor, through his wife Fausta, and it is from her that it derived the name by which it was then sometimes called, “Domus Faustæ”. Constantine must have given it to the Church in the time of Miltiades, not later than about 311, for we find a council against the Donatists meeting within its walls as early as 313. From that time onwards it was always the centre of Christian life within the city; the residence of the popes and the cathedral of Rome. The latter distinction it still holds, though it has long lost the former. Hence the proud title which may be read upon its walls, that it is “Omnium urbis et orbis ecclesiarum mater, et caput”. It seems probable, in spite of the tradition that Constantine helped in the work of building with his own hands, that there was not a new basilica erected at the Lateran, but that the work carried out at this period was limited to the adaptation, which perhaps involved the enlargement, of the already existing basilica or great hall of the palace. The words of St. Jerome “basilica quondam Laterani” (Ep. lxxiii, P.L., XXII, col. 692) seem to point in this direction, and it is also probable on other grounds. This original church was probably not of very large dimensions, but we have no reliable information on the subject. It was dedicated to the Saviour, “Basilica Salvatoris”, the dedication to St. John being of later date, and due to a Benedictine monastery of St. John the Baptist and St. John the Evangelist which adjoined the basilica and where members were charged at one period with the duty of maintaining the services in the church. This later dedication to St. John has now in popular usage altogether superseded the original one. 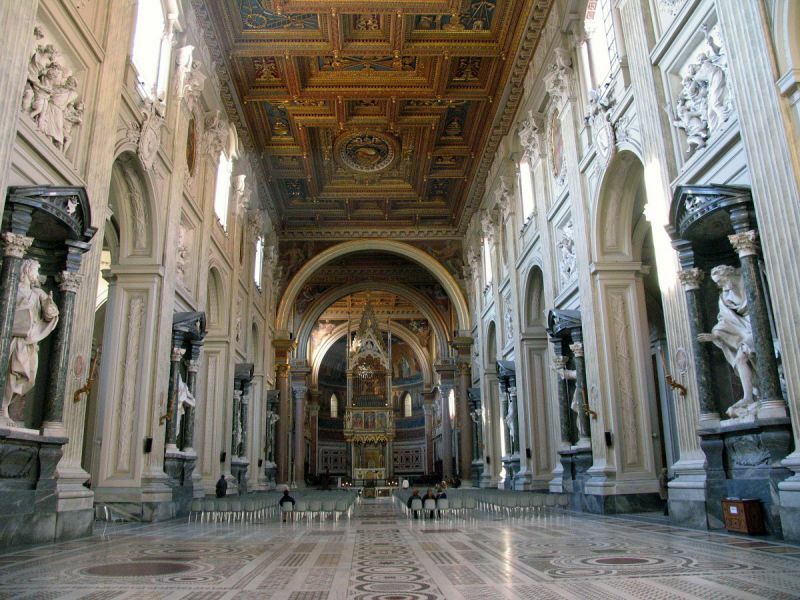 A great many donations from the popes and other benefactors to the basilica are recorded in the “Liber Pontificalis”, and its splendour at an early period was such that it became known as the “Basilica Aurea”, or Golden Church. This splendour drew upon it the attack of the Vandals, who stripped it of all its treasures. St. Leo the Great restored it about 460, and it was again restored by Hadrian I, but in 896 it was almost totally destroyed by an earthquake (“ab altari usque ad portas cecidit”). The damage was so extensive that it was difficult to trace in every case the lines of the old building, but these were in the main respected and the new building was of the same dimensions as the old. This second church lasted for four hundred years and was then burnt down. It was rebuilt by Clement V and John XXII, only to be burnt down once more in 1360, but again rebuilt by Urban V.
Through these various vicissitudes the basilica retained its ancient form, being divided by rows of columns into aisles, and having in front an atrium surrounded by colonnades with a fountain in the middle. The façade had three windows, and was embellished with a mosaic representing Christ as the Saviour of the world. The porticoes of the atrium were decorated with frescoes, probably not dating further back than the twelfth century, which commemorated the Roman fleet under Vespasian, the taking of Jerusalem, the Baptism of the Emperor Constantine and his “Donation” to the Church. Inside the basilica the columns no doubt ran, as in all other basilicas of the same date, the whole length of the church from east to west, but at one of the rebuildings, probably that which was carried out by Clement V, the feature of a transverse nave was introduced, imitated no doubt from the one which had been, long before this, added at S. Paolo fuori le Mura. It was probably at this time also that the church was enlarged. When the popes returned to Rome from their long absence at Avignon they found the city deserted and the churches almost in ruins. Great works were begun at the Lateran by Martin V and his successors. The palace, however, was never again used by them as a residence, the Vatican, which stands in a much drier and healthier position, being chosen in its place. It was not until the latter part of the seventeenth century that the church took its present appearance, in the tasteless restoration carried out by Innocent X, with Borromini for his architect. The ancient columns were now enclosed in huge pilasters, with gigantic statues in front. In consequence of this the church has entirely lost the appearance of an ancient basilica, and is completely altered in character. Some portions of the older buildings still survive. Among these we may notice the pavement of medieval Cosmatesque work, and the statues of St. Peter and St. Paul, now in the cloisters. The graceful baldacchino over the high altar, which looks so utterly out of place in its present surroundings, dates from 1369. The stercoraria,or throne of red marble on which the popes sat, is now in the Vatican Museum. It owes its unsavoury name to the anthem sung at the ceremony of the papal enthronization, “De stercore erigeus pauperem”. From the fifth century there were seven oratories surrounding the basilica. These before long were thrown into the actual church. The devotion of visiting these oratories, which held its ground all through the medieval period, gave rise to the similar devotion of the seven altars, still common in many churches of Rome and elsewhere. Between the basilica and the city wall there was in former times the great monastery, in which dwelt the community of monks whose duty it was to provide the services in the basilica. The only part of it which still survives is the cloister, surrounded by graceful columns of inlaid marble. They are of a style intermediate between the Romanesque proper and the Gothic, and are the work of Vassellectus and the Cosmati. The date of these beautiful cloisters is the early part of the thirteenth century. The ancient apse, with mosaics of the fourth century, survived all the many changes and dangers of the Middle Ages, and was still to be seen very much in its original condition as late as 1878, when it was destroyed in order to provide a larger space for the ordinations and other pontifical functions which take place in this cathedral church of Rome. The original mosaics were, however, preserved with the greatest possible care and very great success, and were re­erected at the end of the new and deeper apse which had been provided. In these mosaics, as they now appear, the centre of the upper portion is occupied by the figure of Christ surrounded by nine angels. This figure is extremely ancient, and dates from the fifth, or it may be even the fourth century. 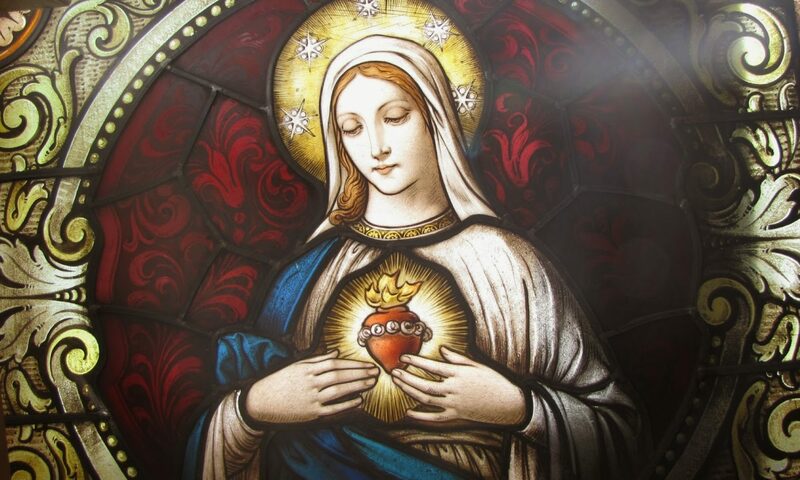 It is possible even that it is the identical one which, as is told in ancient tradition, was manifested to the eyes of the worshippers on the occasion of the dedication of the church: “Imago Salvatoris infixa parietibus primum visibilis omni populo Romano apparuit” (Joan. Diac., “Lib. de Ecclesia Lat.”, P.L. CXCIV, 1543-1560). If it is so, however, it has certainly been retouched. Below is seen the crux gammata, surmounted by a dove which symbolizes the Holy Spirit, and standing on a hill whence flow the four rivers of the Gospels, from whose waters stags and sheep come to drink. On either side are saints, looking towards the Cross. These last are thought to belong originally to the sixth century, though they were repaired and altered in the thirteenth by Nicholas IV, whose effigy may be seen prostrate at the feet of the Blessed Virgin. The river which runs below is more ancient still, and may be regarded as going back to Constantine and the first days of the basilica. The remaining mosaics of the apse are of the thirteenth century, and the signatures of the artists, Torriti and Camerino, may still be read upon them. Camerino was a Franciscan friar; perhaps Torriti was one also. The pavement of the basilica dates from Martin V and the return of the popes to Rome from Avignon. Martin V was of the Colonna family, and the columns are their badge. The high altar, which formerly occupied the position customary in all ancient basilicas, in the centre of the chord of the apse, has now beyond it, owing to the successive enlargements of the church, the whole of the transverse nave and of the new choir. It has no saint buried beneath it, since it was not, as were almost all the other great churches of Rome, erected over the tomb of a martyr. It stands alone among all the altars of the Catholic world in being of wood and not of stone, and enclosing no relics of any kind. 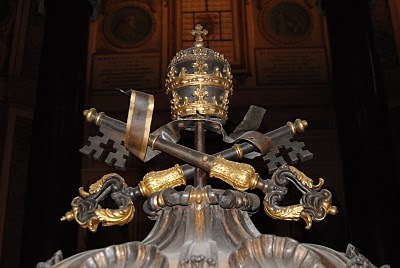 The reason for this peculiarity is that it is itself a relic of a most interesting kind, being the actual wooden altar upon which St. Peter is believed to have celebrated Mass during his residence in Rome. It was carefully preserved through all the years of persecution, and was brought by Constantine and Sylvester from St. Pudentiana’s, where it had been kept till then, to become the principal altar of the cathedral church of Rome. It is now, of course, enclosed in a larger altar of stone and cased with marble, but the original wood can still be seen. A small portion was left at St. Pudentiana’s in memory of its long connection with that church, and is still preserved there. Above the High Altar is the canopy or baldacchino already mentioned, a Gothic structure resting on four marble columns, and decorated with paintings by Barna of Siena. In the upper part of the baldacchino are preserved the heads of the Apostles Peter and Paul, the great treasure of the basilica, which until this shrine was prepared to receive them had always been kept in the “Sancta Sanctorum”, the private chapel of the Lateran Palace adjoining. Behind the apse there formerly extended the “Leonine” portico; it is not known which pontiff gave it this name. At the entrance there was an inscription commemorating the dream of Innocent VIII, when he saw the church of the Lateran upheld by St. Francis of Assisi. On the opposite wall was hung the tabula magna, or catalogue of all the relics of the basilica, and also of the different chapels and the indulgences attached to them respectively. It is now in the archives of the basilica. In the centre of the building one descends by several steps to the basin of green basalt which forms the actual baptismal font. There is no foundation for the idea that the Emperor Constantine was himself actually baptized in this font by Pope St. Sylvester. That is a confusion which has arisen from the fact that he was founder of the baptistery. 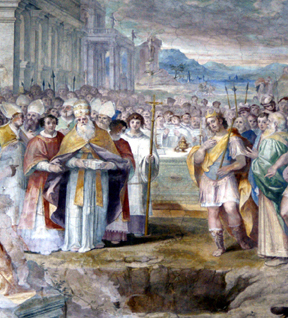 But although he had embraced Christianity and had done so much for the advancement of the Church, the emperor, as a matter of fact, deferred the actual reception of the sacrament of baptism until the very end of his life, and was at last baptized, not by Sylvester, but by Eusebius, in whose diocese of Nicomedia he was then, after the foundation of Constantinople, permanently residing (Von Funk, “Manual of Church History”, London, 1910, I, 118-119; Duchesne, “Liber Pontificalis”, Paris, 1887, I, cix-cxx). The mosaics in the adjoining oratories are both ancient and interesting. Those in the oratory of St. John the Evangelist are of the fifth century, and are of the conventional style of that period, consisting of flowers and birds on a gold ground, also a Lamb with a cruciform nimbus on the vault. The corresponding mosaics of the chapel of St. John the Baptist disappeared in the seventeenth century, but we have a description of them in Panvinio. The mosaics in the chapel of St. Venantius (the ancient vestibule) are still extant, and are of considerable interest. They date from the seventh century, and a comparison between the workmanship of these mosaics and of those in the chapel of St. John offers an instructive lesson on the extent to which the arts had deteriorated between the fifth and the seventh centuries. The figures represent, for the most part, Dalmatian saints, and the whole decoration was originally designed as a memorial to Dalmatian martyrs, whose relics were brought here at the conclusion of the Istrian schism. From the beginning of the fourth century, when it was given to the pope by Constantine, the palace of the Lateran was the principal residence of the popes, and continued so for about a thousand years. In the tenth century Sergius III restored it after a disastrous fire, and later on it was greatly embellished by Innocent III. This was the period of its greatest magnificence, when Dante speaks of it as beyond all human achievements. At this time the centre of the piazza in front, where now the obelisk stands, was occupied by the palace and tower of the Annibaldeschi. Between this palace and the basilica was the equestrian statue of Marcus Aurelius, then believed to represent Constantine, which now is at the Capitol. The whole of the front of the palace was taken up with the “Aula Concilii”, a magnificent hall with eleven apses, in which were held the various Councils of the Lateran during the medieval period. The fall of the palace from this position of glory was the result of the departure of the popes from Rome during the Avignon period. Two destructive fires, in 1307 and 1361 respectively, did irreparable harm, and although vast sums were sent from Avignon for the rebuilding, the palace never again attained its former splendour. 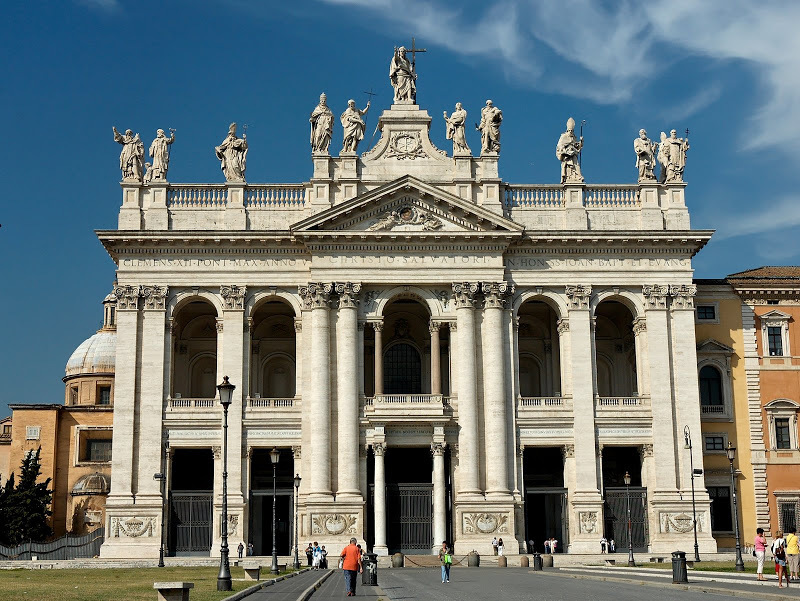 When the popes returned to Rome they resided first at Santa Maria in Trastevere, then at Santa Maria Maggiore, and lastly fixed their residence at the Vatican. Sixtus V then destroyed what still remained of the ancient palace of the Lateran and erected the present much smaller edifice in its place.